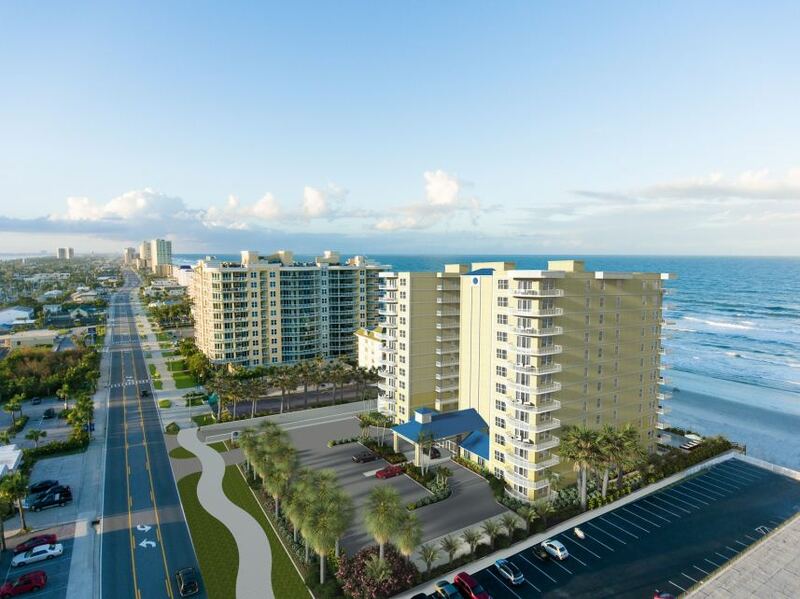 DAYTONA BEACH, Fla. - May 29, 2018 - PRLog -- GreenPointe Communities LLC proudly announces vertical construction is underway for The Aruba Condominium, one of only two new oceanfront condominium developments to proceed in Daytona Beach Shores since 2008. Demolition and removal of the existing structures and accompanying earth work has been completed at the site of the new condominium. "We are thrilled to be moving forward with our next phase of development at The Aruba," said Grady Miars, President of GreenPointe Communities. "The Aruba Condominium is the fastest selling condominium in the region with over $22 million in contracts. Our success is a direct reflection of the rising demand for vacation and second homes in the Daytona Beach Shores real estate market." The Aruba Condominium is more than 55 percent pre-sold. The long-standing, high quality Daytona construction company, Peck & Associates Construction, Inc., are mobilizing their team to commence the vertical construction phase. The Aruba Condominium will be one of the first oceanfront condominiums built under Florida's new building code and construction standards. With demolition and site work nearing completion, construction of The Aruba is expected to last approximately 18 months with completion in November 2019. Located just steps from the Atlantic Ocean, The Aruba will rise 12 stories, housing 60 condominium homes with spectacular views of the Atlantic Ocean as well as 24 homes that offer stunning ocean and Halifax River views. The Aruba's spacious three- and four-bedroom floor plans, ranging in size from 1,400 square feet to more than 1,800 square feet, have been carefully designed to provide owners with that coastal casual atmosphere only found in the Sunshine State. Oceanfront heated resort-style pool, state-of-the-art fitness center, under-building parking and on-site storage units are just a few of the upscale comforts found at the Aruba. Each residence includes a private balcony showcasing the endless horizon of ocean and river views. Priced from the $300,000s, each residence will include luxurious interior finishes, well-appointed bathrooms, gourmet kitchens with stainless steel appliances, designer wood cabinetry and beautifully crafted solid surface countertops and numerous energy-efficient features. Daytona's ultimate Florida lifestyle and proximity to Tampa and Orlando makes it a wonderful location to live. The Aruba Condominium offers a lock and leave lifestyle and is an excellent choice for those looking for a new or second home. With vertical construction underway, The Aruba's pre-construction pricing will end soon. The Aruba Condominium sales office, located at 3162 South Atlantic Ave. in Daytona Beach Shores, is open from 10 a.m. to 5 p.m. Monday through Saturday, and by appointment on Sunday. To receive a list of available inventory and pricing, contact (386) 320-3778 or info@thearubacondos.com. For more information, visit www.TheArubaCondos.com.